Mother’s Day was spent over at my sister-in-laws house out in the country. Not only did I get some great shots of Anya and her cousin, but I managed to get some pretty good shots of my wife’s Grandpa. 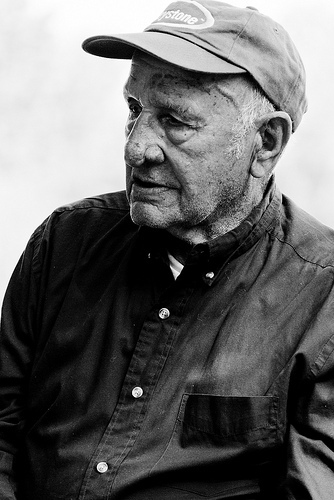 He was a hard working dairy farmer and to this day is still a hard working man, well into his 80’s. I managed to get some candid shots as my wife and him were talking. I think he was a little weirded out by me shooting, but I’m pretty sure he soon forgot about it because it was a good conversation he was involved in and I was shooting with the 200mm lens, so I wasn’t right on top of him. I always like candid shots in black & white, plus the Tom has a great face with a ton of character, so it makes for great contrast. Anyway, I really like these shots.